These strength moves will keep mamma fit and strong and super prepared for giving birth. You probably wouldn’t attempt an IronMan or the Comrades with no training. So surely the same logic should apply to something called “labour”? After all, it didn’t get that name for no reason. 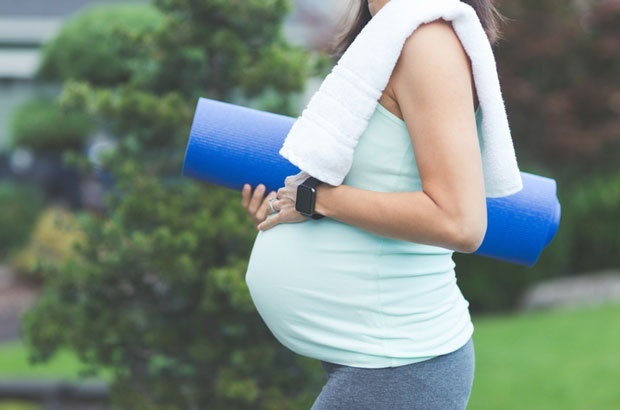 Every pregnancy is different, but if you’re able to exercise, doing regular strength training can have major benefits for both your pregnancy and your delivery. There’s a reason backpacks have two straps – it’s so that you can distribute the weight evenly, in a balanced way. Carrying a heavy weight on just one side of your body puts major strain on your muscles and in no time at all, you’ll start feeling all kinds of unpleasant aches and pains. But when you’re sporting a growing bump, you don’t have the luxury of adjusting how that new added weight is distributed. Add your suddenly-enormous breasts to the mix and there’s a whole lot weighing you down in front and nothing to balance it out at the back. The result? That quintessential pregnancy back pain. Strength training can help lessen the ache by helping your body support the growing weight. It may not take it away entirely, but you’ll likely struggle a lot less. If you’re having a natural birth, you could be in it for the long haul. Every birth is unique, but it’s common for labour to last between eight and 12 hours – that’s like flying to the UK – and it’s not unheard of for it to continue as long as 18 hours or longer. Having strong muscles, particularly in your core, will mean your body is better prepared for the physical demands. You may even find it easier to push baba out into the world – research suggests women who exercise regularly during pregnancy reduce their likelihood of a forceps delivery by more than 70 percent. For women who enjoy exercise, there’s nothing worse than being benched. And after the physical toll of pregnancy and labour, your body’s going to need time to heal. The good news is that women who keep up with a regular exercise routine during pregnancy usually recover faster, so you can get back to that yoga class you love. Just go easy on yourself – your body’s been through a lot to deliver that bundle of joy into your arms, so take it slowly and build from there. Durban-based biokineticist Raeesa Solwa designed this preggy workout when she was 23 weeks into her pregnancy. Do the moves in order, for the number of reps indicated, resting as needed. When you’ve done all the moves, repeat the circuit again for a total of three or four rounds. Important: Make sure your doctor has cleared you to exercise before performing any workouts.